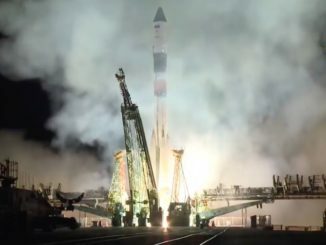 Running nearly a month late because or difficult work to repair a damaged cable in the Soyuz MS-02/48S command module, the workhorse Soyuz FG booster roared to life and shot away from its firing stand at 4:05 a.m. EDT (GMT-4; 2:05 p.m. local time), climbing straight into the plane of the space station’s orbit. At the controls, strapped into the central command module’s middle seat, was vehicle commander Sergey Rizhikov, flanked on his left by flight engineer Andrey Borisenko and on the right by NASA astronaut Shane Kimbrough. Eight minutes and 45 seconds after liftoff, the Soyuz MS-02 spacecraft was released from the booster’s upper stage to fly on its own and a few moments after that, its two solar panels and antennas unfolded as planned. 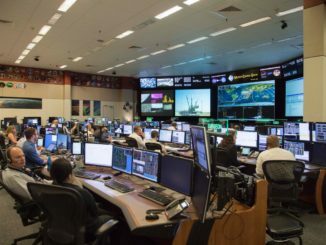 Flight controllers told the crew the spacecraft was in good shape as it began a two-day rendezvous with the space station. In recent years, Soyuz spacecraft have followed a faster, six-hour rendezvous profile, but the Soyuz MS-02 is only the second in a series of upgraded ferry ships featuring a variety of new components and improvements. 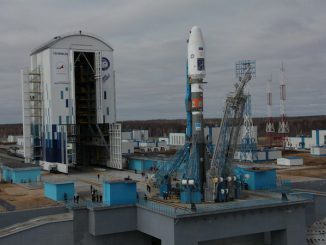 As with the MS-01 launch in July, Ryzhikov and company will carry out a series of tests en route to the space station to confirm the new systems are operating properly. 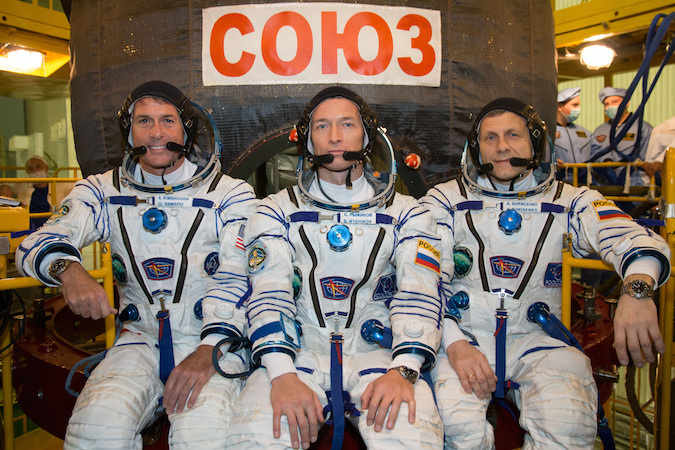 The MS-02 crew plans to remain aboard the station for four-and-a-half months, returning to Earth at the end of February. During a pre-launch news conference, a reporter with the Russian news agency RT asked Kimbrough if he would be able to cast his vote in the U.S. presidential election from space. While Ryzhikov is a space rookie, Borisenko, a former Russian flight controller and rocket engineer, is making his second trip to the international space lab after a 164-day stay in space in 2011. Kimbrough flew aboard the shuttle Endeavor in 2008, logging 15 days in orbit and participating in two spacewalks. This time around, Kimbrough said he’s looking forward to having a bit more spare time to enjoy the view from 250 miles up. He plans to take lots of pictures. If all goes well, Ryzhikov and Borisenko will monitor an automated approach to the space station, gliding in for a docking at the Russian segment’s upper Poisk module around 6 a.m. Friday. 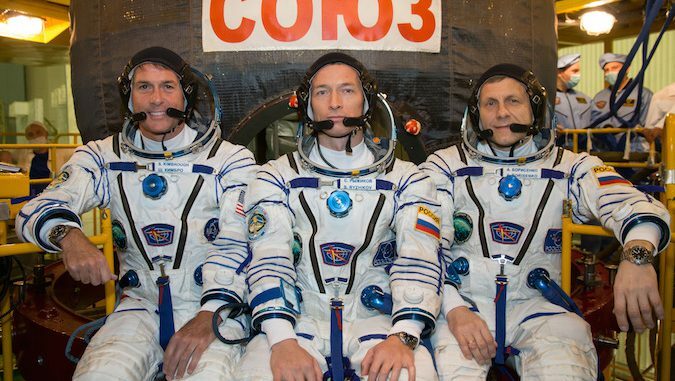 Standing by to welcome them aboard will be Expedition 49 commander Anatoly Ivanishin, Japanese astronaut Takuya Onishi and NASA astronaut Kate Rubins, who were launched to the outpost July 6 aboard the Soyuz MS-01 spacecraft. They’ve had the station to themselves since Sept. 6 when Soyuz TMA-20M commander Alexey Ovchinin, Oleg Skripochka and Jeff Williams returned to Earth. With the station crew back up to six, Ryzhikov, Borisenko and Kimbrough will face a busy first few days in space with arrival early Sunday of an Orbital ATK Cygnus cargo ship carrying some 5,100 pounds of equipment and supplies. The Cygnus was launched from Wallops Island, Va., Monday evening, one day late because of problems with ground equipment. As a result of the delay, the Cygnus rendezvous was stretched out to make way for the Soyuz MS-02 launch and docking. Once the Cygnus is berthed at the central Unity module’s Earth-facing port, the station crew will begin unloading supplies and equipment, including food, clothing, research gear, new laptop computers and other needed items. A little more than a week later, on Oct. 29 U.S. time, Ivanishin, Onishi and Rubins will strap into their Soyuz MS-01 spacecraft, undock and return to Earth just before midnight Eastern Time, landing on the steppe of Kazakhstan to close out a 115-day mission. With Ivanishin’s departure, Kimbrough will take over as commander of the Expedition 50 crew. He and his crewmates will be joined two weeks later by Soyuz MS-03 commander Oleg Novitskiy, European Space Agency astronaut Thomas Pesquet and NASA astronaut Peggy Whitson, who are scheduled for launch from Baikonur on Nov. 15. Pressing ahead with a busy schedule of research, the expanded Expedition 50 crew will welcome a Japanese HTV cargo ship and a Russian Progress freighter in December. Running behind schedule because of propellant system problems, the HTV is particularly critical to station operations because it’s loaded with six lithium-ion batteries that are needed to replace 12 aging nickel-hydrogen power packs used by one of the station’s four sets of solar arrays. The new batteries will be installed during two spacewalks tentatively planned for January. It’s not yet known who will carry out the EVAs, but Kimbrough, Whitson and Pesquet have all practiced the battery replacement procedures in NASA’s huge Neutral buoyancy Laboratory pool at the Johnson Space Center in Houston. The Russians originally planned to launch Ryzhikov and company in September on a five-month mission. 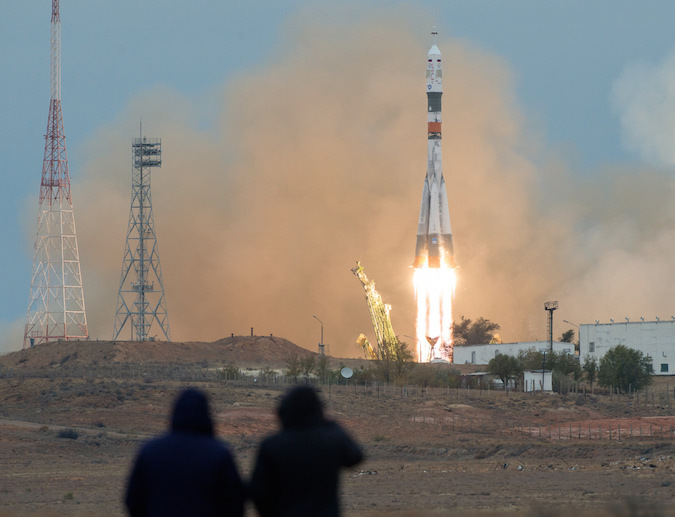 But the flight was delayed when engineers found a short circuit during pre-flight tests of the Soyuz ferry ship. The short eventually was traced to a cable in the command module behind the crew seats.